Take a deep breath. You've got this! And we've got your back. By putting together a smooth timeline, you can ensure that you're going to enjoy every single moment. Because when you blink, it's all over! A well planned timeline will not only ensure you're going to have a stress free day, but it ensures that we can capture every single moment for you to treasure for decades to come! These first couple of hours are a fabulous way to set the tone for the entire day! Every bride deserves to enjoy the morning with her girls and get a little TLC. If you have the luxury of hiring a makeup or hair artist to take care of you and your bridesmaids, we strongly encourage you to do so. (And if you need a recommendation, we would LOVE to send you a list of our favorites!) These artists are experts at ensuring your hair and makeup will last till the very end of the day. Having a team in place to take care of those getting ready details ensures that you will get to sit back, relax, and have a wonderful time with your closest ladies. So, turn on some music, and enjoy a mimosa or two! If possible, it is recommended that the bridesmaids and groomsmen get ready at the same location (hotel or ceremony location) if you are interested in having final preparation photos not only taken of just the bride, but the groom as well. ...No worries, we are pros at making sure the bride and groom do not run into each other. If it is not possible to get ready at the same location, then we recommend getting ready no further than 20 minutes away from each other. When we arrive to the Bridal Suite, we always recommend that we start off with the Bride's detail's right away. We've found that if we don't, the day rolls like a snowball and we will never get a chance to shoot those important details later on. So, have all your details ready to go when we arrive such as your dress, the rings, shoes, invitations, jewelry, perfume, the veil, ect. We also recommend giving us 30 minutes to shoot all of these details when we arrive. As soon, as we are finished, we are focused on you, your ladies, and all the candid bliss of getting ready. We are true believers that this moment should be savored and never rushed over! This is when the day gets REAL! Remember to give yourself plenty of time to get into your dress. We recommend 20 - 30 minutes. Especially if there are intricate buttons, details, or lacing involved! And, if it's just a simple zip, make sure to still give yourself extra buffer time just in case. We've seen some last minute wardrobe malfunctions, but there's no stress if you've given yourself plenty of buffer time to handle those fixes with the help of your lady squad. We encourage the groom to set aside just 30 minutes for getting ready photos with Jordan while Meg stays with the ladies for candids. We encourage the groom and his groomsmen to be halfway dressed for when Jordan arrives (pants and shirts on). Let those last details be captured during Jordan's arrival such as neckties, cufflinks, and jackets. * A note about Neckties: If you have never tied a necktie before, make sure to practice before the day of your wedding. It can be quite a learning experience and time consuming if you wait to try for the first time on your big day. We recommend scheduling our arrival time to your ceremony location no later than 30 minutes before your ceremony starts. ...Especially if your ceremony is taking place indoors. We want to make sure we do everything we can to avoid shooting with our flashes, so this allows us to get our cameras set for this new location, capture the details of your space, along with candids of your guests arriving. Even if you plan on staying at your ceremony site for family photos after your formal exit, we encourage you to have a car, bus, or trolley at the end of your exit that you can jump into. Even if you jump in and simply have your driver swing around the block, it encourages guests to start leaving and heading to your reception site. If you do not have a way of "getting away" from your formal exit, then you will be tackled with hugs, kisses, congratulations, and conversations. That's exactly why your guests are there, but it makes it very hard for you to get to your next event, which is most likely family photos or cocktail hour. Save the long conversations for the reception when you can focus on your guests without having to worry where you need to be next. We absolutely love formal ceremony exits! Just remember that if you plan on having a formal exit with bubbles, petals, or confetti, you will need at least two people to help pass out these items to your guests and then direct them to where they need to stand. Without direction, your guests will not be aware that they are to stick around for this sweet send off. This will also help the day flow more smoothly so you can get family photos started more efficiently or, get you off to your cocktail hour sooner. ...which means more time for the two of you to relax and mingle. Also, just a friendly reminder to notify all your family members ahead of time who are a part of family photos not to leave after the formal exit if pictures are taking place at your ceremony site. We love doing your bridal party photos all at once to save you the most time. We need 30 minutes of time built into your day to capture all the different varieties of Bridal Party Photos such as the large group shot, the Bride with her bridesmaids, the groom with his groomsmen, and individuals of the Bride with each bridesmaid and the Groom with each groomsmen. To ensure that the two of you will have plenty of time to capture a variety of photos, we recommend that you build in 30 - 45 minutes of time for us to steal just the two of you away. If you are planning on doing a first look, then we recommend starting portraits of just the two of you right after you see each other for the first time because you won't be able to contain your smiles and joy in that moment. If we could offer you one of our biggest tips toward saving time during photos, it would be to keep your photo locations to no more than two destinations. You do not want to spend more time traveling to your locations than getting to actually take photos. When we arrive at a location for photos, we are scoping out the light at that exact time of day. The light is constantly changing throughout the day and light direction is key to a beautiful photo. We have shot some of our most favorite portraits in downtown allies between chained link fences and dumpsters, but because there was good light, we could create beautiful portraits. So, do not stress when it comes to picking the most perfect photo location. We really encourage you to settle on a location that is close to where your ceremony and reception are taking place. Or perhaps, we can simply take portraits right where your day is taking place. Remember that if you decide on taking photos somewhere other than where your wedding day is taking place, that you research ahead of time if you will need to purchase a photo permit at that location. Locations such as the Chicago Botanic Gardens, the Morton Arboretum, or the gardens at the Art Institute of Chicago will not allow a bridal party or photographer to enter their grounds without proof of a pre-purchased photo permit. We are major advocates for our couples doing a first look. By getting your photos taken care of before the ceremony, you are allowing yourselves time to enjoy the reception that you have been planing and investing in for months, maybe even years. We recommend setting aside 15 minutes for your first look time, followed by 30 - 45 minutes of portraits of just the two of you. You both will look your freshest! You can schedule all wedding party photos before the ceremony, so afterwards all the formal images left to take are family photos and then you’ll be able to head to your reception quickly instead of having your guests wait for a longer period of time. Or you can even take care of all your family photos before the ceremony as well! If you do not want to see each other before the ceremony, we recommend setting aside 30 - 45 minutes for portraits. Followed by 30 minutes for your Bridal Party Portraits and 30 minutes for your Family Photos. 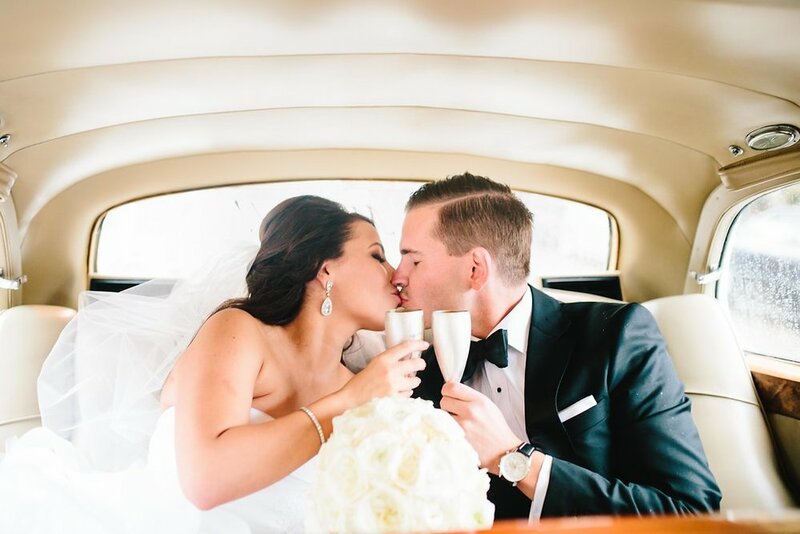 If you are wanting to have a cocktail hour for guests between the ceremony and reception, taking the bulk of your images after the ceremony will allow your guests to mingle and enjoy drinks while you’re getting your pictures taken. If the ceremony begins late, or family photos run longer than expected, then it’s always the bride and groom's photo time that gets cut short. Depending on how long photos take, there is the possibility that we are not back into time to cover the reception details before your guests are taken into the reception room. We recommend scheduling your big events of the reception within the first hour of the dance floor opening; such as the bouquet/garter toss, cake cutting, first dances, etc. A good portion of wedding guests tend to leave a little bit after the meal so having the main events while guests are still around look great for photos, and of course allows you to share these events with those who have to leave early. We recommend allowing us to go into your reception space for 20 - 30 minutes before the doors are open to your guests. This allows us to capture all of the beautiful details you have worked so hard on. These details would include the cake, table settings, centerpieces, the sweetheart table or head table, place cards, ect. Once your guests are ushered into the room, it is nearly impossible to get a clean shot of these photos without having to inconvenience your guests. 2. Be selective with who will participate in the sparkler send off. Here's why: It's not necessarily beneficial to have every single one of your guests be a part of this event from a photography perspective. The more people there are lined up, the harder it is to direct the photo. Also, by the time one end of the line has there sparkers lit, the other ends sparkers have already gone out. Here's who we recommend being a part of this moment: Your Bridal Party and your immediate family members. 25 - 40 people are the perfect amount of people to line up for a flattering sparkler photo. 3. The extra long sparklers are amazing for photos! They burn longer and give you more time to walk up and down more than once and maybe even enough time to get a few pictures of the two of you holding them as well.